The storefront at Central Market on Friday afternoon. Police are investigating a hate crime apparently committed by a confused young man in east Charlotte last night. According to CMPD, officers responded to Central Market on Albemarle Road just before 10 p.m. last night in response to a fire. 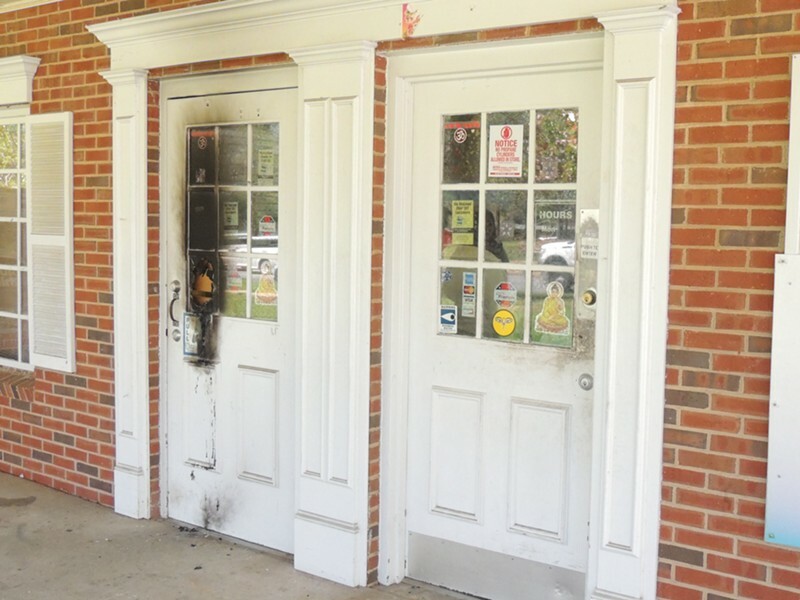 By the time they arrived, the fire had already burned itself out, only damaging the front door of the business. 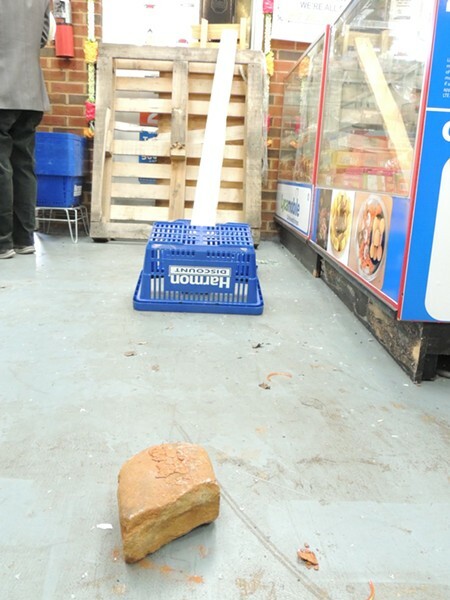 Police quickly found that the business had been intentionally damaged, as someone had thrown a large rock through a pane of glass on the front door. The suspect left behind a note explaining why he had broken the glass and set the fire, stating that President Donald Trump "is our nation builder for whites" and that refugees and immigrants "are not allowed to do business anymore." He signed the letter, "White America." Confusing matters a bit is that the entire incident was caught on surveillance camera, and police say the suspect was actually a black man, approximately 5 feet 8 inches tall, 200 pounds with a short afro and a goatee. Kamal Dhimal speaks from inside his store (above), where a stone that was thrown through the window last night still lies (below). Kamal Dhimal, owner of Central Market, said he didn't want to speculate on the note or blame any group of people. "If I focus on somebody else, if I say, 'Oh, you did this,' I don’t know, who is that?" Dhimal said. "I don’t want to blame anybody. That might be my fault to have come to this country as a refugee, but this country welcomed me. They welcomed me and they gave me citizenship. I don't know why at this time, this situation has come up. I have no idea how we can solve this issue, but this is a serious one." A part of the note reads, "We know you are one and many of other immigrant [sic] doing business here. This is our warning. Leave the business and go back where you came from. If you don't follow this warning then we are not responsible for the torture starting now." 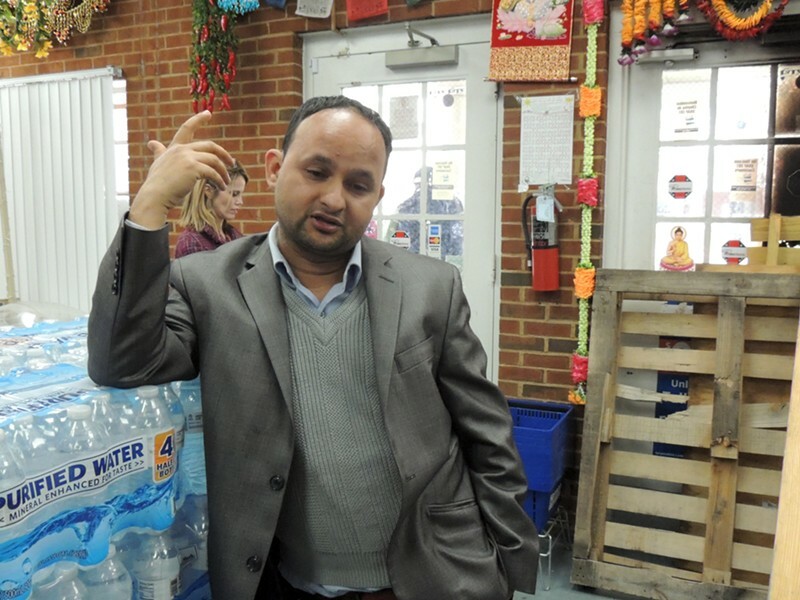 Dhimal, a Bhutanese refugee who has been in Charlotte for 20 years, said he is most concerned with police finding the one person responsible for damaging his business. "Someone threatened me, they threatened my family. Somebody hit the door of my business, they hit me, I’m understanding it that way," he said. The incident comes two weeks after 33-year-old Summayah Khan reported that a white man pointed a rifle at her in the parking lot of an Indian grocery store in the University area. Khan was wearing Muslim garb at the time. CMPD is planning a press conference regarding this incident that will begin at 2 p.m.